ALL Members are welcome to help, chat and meet old and new members. 11 a.m. SHARP, IN GERMAN. Information regarding lunch to follow. Restaurant: Noon-O-Kabab, 4701 N. Kedzie Ave.
Come enjoy tasty Persian dishes inspired by family recipes. Kash-ke-bademjan (roasted, mashed eggplant topped with caramelized onions and yogurt) complements succulent lamb Koubideh and beef tenderloin skewers. Tadiq (crispy saffron rice with yogurt) with Ghormeh Sabzi (spinach, parsley, green onions, cilantro, and fenugreek slowly cooked with lamb, red beans, and dried lime) is another standout. NOTE: THE RESTAURANT IS A 3 MINUTE WALK FROM THE KEDZIE STOP ON THE BROWN LINE. WE WILL MEET AT THE RESTAURANT. PLEASE BRING CASH. Starbucks, Radisson Blu Aqua Hotel, 221 N. Columbus Dr.
Story: Natalie is a philosophy professor who may not figured everything out, but has arrived at midlife with a measure of wisdom and comfort, until her world collapses. Bring your knit or crochet projects or just come to learn and chat! 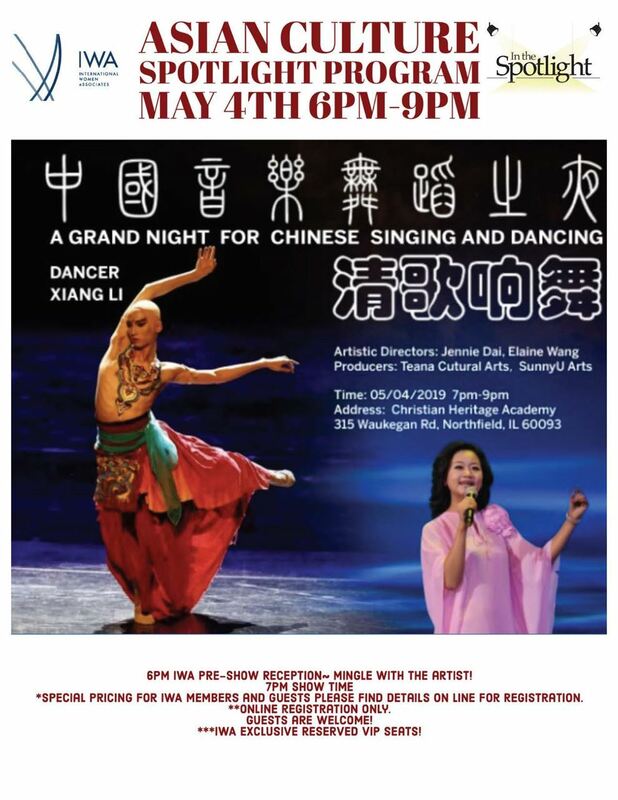 RSVP to IWA (online or to the Asian Culture Chair) by 4/20/19 AND purchase your tickets from https://www.eventbrite.com/e/a-grand-night-for-chinese-singing-and-dancingiwa-tickets-56954650894 for the show. 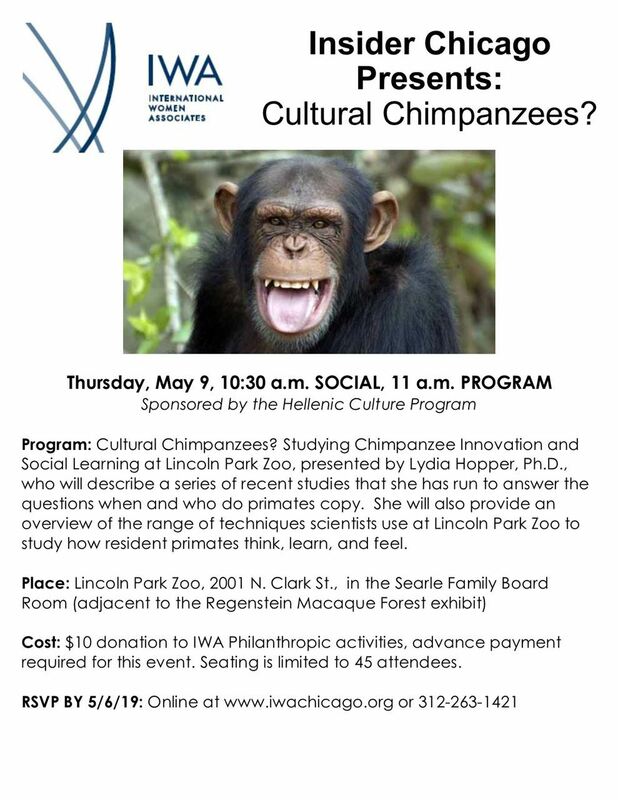 Lincoln Park home of IWA member to be provided upon registration. Isabelle David, director of the French-American School of Chicago and passionate about literature, will lead a discussion in French about the book “Chanson Douce” (English version: “The Perfect Nanny”). We welcome all bridge players; beginners with just the rudimentary knowledge of the game, the ’rusty’ ones who played many years ago and wish to re-acquaint themselves with the game, advanced players sharing their experience with beginners and anyone who wishes to just observe a game. 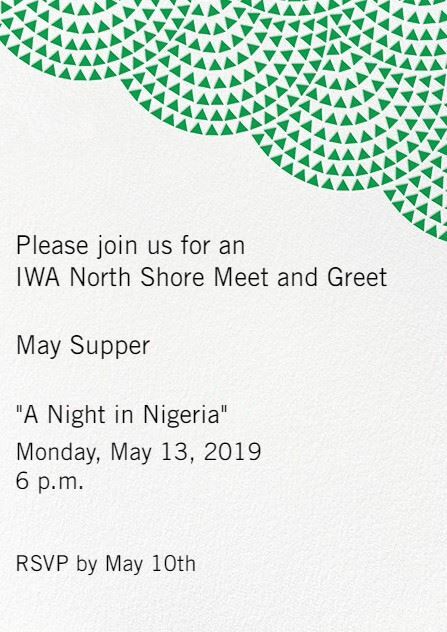 Please Note: IWA North Shore Meet and Greets are open to all IWA members! Program: Reading Between the Lines: Unlocking minds. Unlocking opportunities. Discussions of short, powerful texts build critical thinking and communication skills. Whether it is between cultures, nations, neighborhoods, experiences or people, especially those who have been incarcerated, communication is key. Join Joan Shapiro, Executive Director, and colleagues of Reading Between the Lines to experience the strikingly simple but novel approach to re-entry that also applies to cross-cultural communication. Participants learn fundamental tools to help engage with the world. Party Room, 130 N Garland Ct. The joint English-Speaking World and European event in May, "Brexit and Beyond," is scheduled for May 15. Please disregard the reference to May 8 in the description of the event.. There are also some other significant changes! It will be an evening, rather than a morning meeting, and will have social time from 5 to 6 PM with the program commencing at 6PM. Due to the prominence of our speaker, we are opening the meeting to IWA members' spouses and guests. Our speaker will be the Hon. John Saville, H.M. Consul-General in Chicago. We are grateful to him and to the British Consulate General in Chicago for his appearance with us. Note: 10:30 a.m. SOCIAL, 11 a.m. The May 22, 2019 New Member Orientation is by invitation only. Please see emailed invitation for event details. Sayat Nova Armenian Restaurant, 157 E Ohio St. This legendary restaurant right off Michigan Avenue serves grilled meat and vegetarian options. Some dishes are similar to other Middle Eastern cuisine, while others are unique and authentic Armenian. Delicious appetizers! Great food for sharing! Join us for unique ethnic dining right downtown. NOTE: WE WILL MEET AT THE RESTAURANT. PLEASE BRING CASH. Program: "Untold Stories of the Forgotten War: The Turkish Brigade, North Star" The military historian & author Don Sender will tell the untold stories of courage Turkish troops exemplified during the Korean War and remind us the kinship the United States, Turkey, and South Korea have in their shared history. His presentation will be followed by a panel discussion including Turkish and Korean Consul Generals and a regional representative of the U.S. Army. NOTE: DATE/TIME CHANGE. 11:30 a.m. SOCIAL, 12 p.m. PROGRAM. The June 26, 2019 New Member Orientation is by invitation only. 03/08/2019 March 8, 2019 - International Women's Day Celebration! 02/25/2019 European Culture: What's Truly Healthy Anyways, These Days?" 12/04/2018 French Language (in French): Party des fêtes! 11/06/2018 French Language: Discussion of "Jean de Florette"
10/11/2018 Hellenic Culture: "Lives Afloat: The Greek Refugee Crisis"
10/02/2018 French Language: "Les Faux Amis"
06/16/2018 Polish Language: "Helping Women and Mother Nature"
06/13/2018 Modern Professional: Summer Celebration! 06/07/2018 June Spotlight, Film Viewing and Discussion: "The Salesman"
06/05/2018 French Language: End of the Year "Pique-Nique"
04/24/2018 April China Gala Committee Meeting II. 04/18/2018 Arabic Culture: "The Angel: The Egyptian Spy Who Saved Israel"
04/12/2018 April China Gala Committee Meeting I. 03/27/2018 March China Gala Committee Meeting II. 03/22/2018 German Language: "Morgen spielen wir Schwestern"
03/19/2018 Film Discussion & Spanish Language: "Wild Tales"
03/15/2018 March China Gala Committee Meeting I. 03/08/2018 March 8th - International Women's Day Celebration! 03/06/2018 French Language: "Marcel Proust, from snob, to lover to artist"
02/27/2018 February China Gala Committee Meeting II. 02/19/2018 Spanish Language: Tango Time! 02/09/2018 Insider Chicago: A Jean-Louis Haguenauer Concert, "Tribute to Debussy"
02/06/2018 February China Gala Committee Meeting I. 02/05/2018 Performing Arts: "All My Sons"
02/01/2018 Film & French Joint Program: "Elle"
01/23/2018 January China Gala Committee Meeting II. 01/23/2018 Asian & French Joint Program: "When French Pastries Meet Chinese Teas"
01/20/2018 Sushi & Sake 101, Gala Sign Up Event, Spots are Available! 01/11/2018 January China Gala Committee Meeting I. 01/10/2018 English-Speaking World: "International Adoptions"
01/09/2018 Modern Professionals: "Persistent Pain"
12/21/2017 German Language:"Eine Weihnachtsfeier bei Hildegard"
12/07/2017 Film Discussion: "45 Hours"
12/04/2017 Performing Arts: "Marie Christine"
11/17/2017 Asian Culture & Literature Joint Program: "Monkey: Folk Novel of China"
11/06/2017 Performing Arts: "A View From The Bridge"
11/02/2017 Film Discussion: "A Man Called Ove"
10/31/2017 Spanish Language: Visit to the National Museum of Mexican Art"
10/24/2017 Asian Culture: "Let's Roll the Korean Way!!" 10/02/2017 Performing Arts: "The Audience"
09/20/2017 Arabic Culture: "The Two Million"
09/18/2017 Spanish Language: "How Do You Do?" 09/14/2017 Hellenic Culture: "Thinking About Women and Gender in Athenian Drama"
09/12/2017 Modern Professionals: "The Body Message"
09/07/2017 Asian Culture & Film Discussion Joint Program: "A World Without Theives"
08/07/2017 Performing Arts: "Ah, Wilderness"
06/05/2017 Performing Arts: "Great Expectations"
05/22/2017 European Culture: "My Life as a Diplomat"
05/17/2017 Arabic Culture & Film Discussion Joint Program: "The Square"
05/01/2017 Performing Arts: "Linda Vista"
01/11/2017 The IWA International Gourmet Group presents: "A Winter Luncheon from Normandy"
09/28/2016 Open House Celebration at Our New Office and Volunteer Fair! 05/13/2016 RAFFLE TICKETS for IWA Gala 2016, "Celebrating Germany"
05/13/2016 Sponsorship Opportunities, IWA Gala 2016 "Celebrating Germany"
05/13/2016 TICKETS TO THE IWA Annual Gala "Celebrating Germany"
04/06/2016 The IWA International Gourmet Group presents: "A Celebration of the New Season, AN EARLY SPRING PASTICHE"
03/31/2016 Insider Chicago, "Dressing Downton!" 01/25/2016 IWA New Year Open House...Goodbye Suite 1800...Hello 2016!